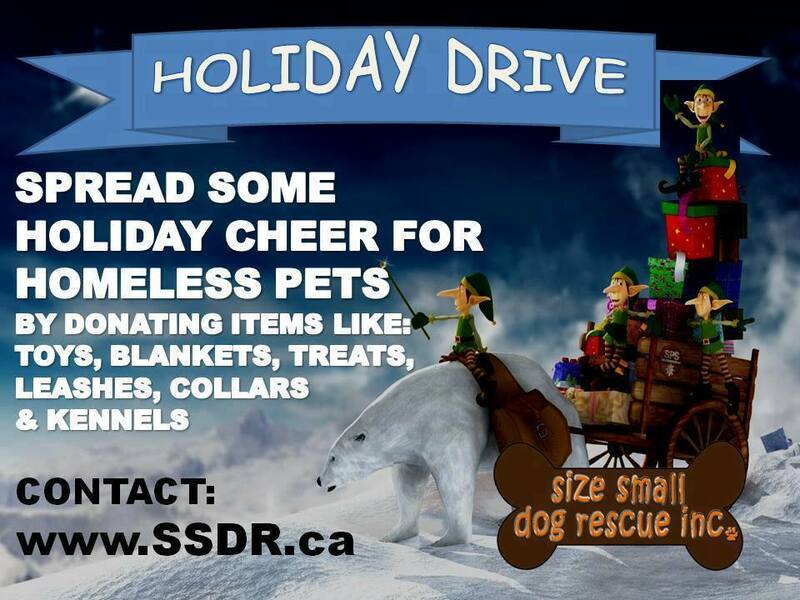 Upcoming Events - Size Small Dog Rescue Inc.
Come out to Pet Valu in Canarama Centre for another amazing SSDR adoption event! 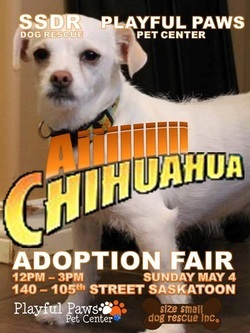 There will be some of our adoptable dogs waiting to find their furever home! Race you there! Critters has their annual food drive happening now. Please help us feed hungry dogs. Are you dreaming of getting away on a tropical island vacation? Instead of you going to the islands, let the islands come to you! Please join us for our first ever Bow Wow Luau benefiting Size Small Dog Rescue Inc. (Saskatoon, SK)! Hawaiian shirts (the louder the better), flip flops and muumuus are more than welcome (but not mandatory)! Tickets are $20 (in advance only) for your choice of steak or chicken fingers or vegetarian stir fry, children 12 and under are $12 (chicken finger basket). There will be a cash bar, silent auction table and 50/50 draw. Doors open at 6:00 pm, supper is at 6:30 pm. Please email Nicole at [email protected] or go to the SSDR facebook page for tickets. There will be no tickets at the door. 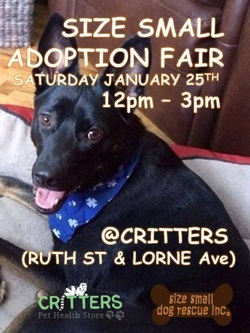 ***Breaking News*** SSDR is having an Adoption Event on Saturday, January 10th from 12-3 at Critters on Lorne and Ruth. Please share this poster and let's make it a great success! Armani and all of our adoptable dogs are wishing to be with their forever families for Christmas. 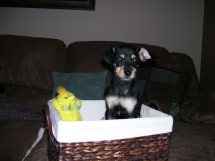 Are you ready to let a special dog be your forever gift to yourself? 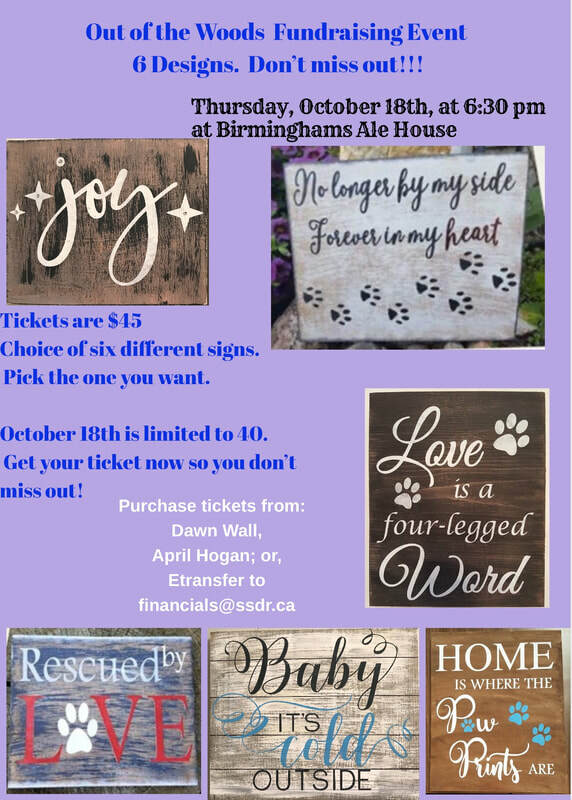 Come on out to Playful Paws on November 16th for another amazing SSDR adoption event! there will be plenty of our adoptable dogs waiting to find their furever home! Race you there! The dogs are going to Warman Do you like dogs or fresh baking? Does your canine companion need a nail trim? All of the above can be done when we are at the Petvalu this Saturday from 11-3. 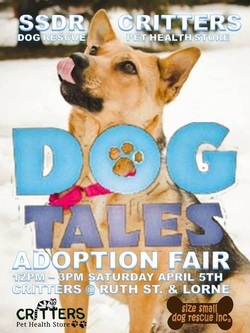 You read that right, there is a bake sale that will be happening, and a groomer will be on site to do nail trims for $10, with $$ going back to the rescue dogs. Come on out and support a great cause. 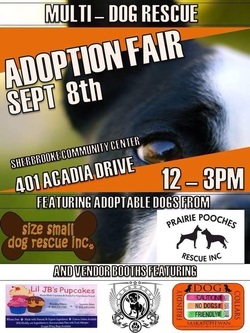 SSDR's Adoption Event is coming up on Saturday, September 20th from 11-3 at the Warman Petvalu store. The address is 810 Centennial Blvd. We hope to see you there. There will be some puppies in attendance! 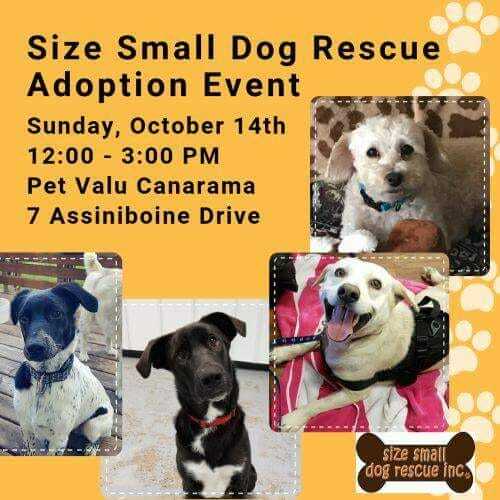 Size Small will be having an adoption event this Sunday, September 7th in conjunction with the Day of Play in the park by the Bessborough. 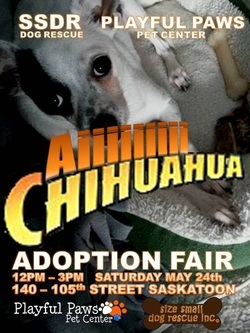 Please feel free to come on down to see our adoptable dogs, or to just have some snuggles. 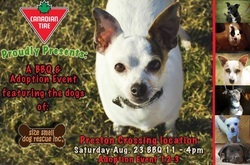 Hosted by our good friends at Canadian Tire Preston Crossing — at Canadian Tire Preston Crossing. 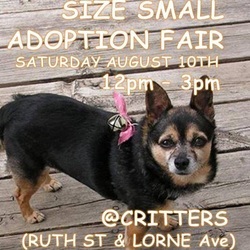 Size Small Dog Rescue BBQ Fundraiser! 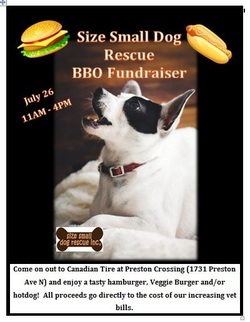 Come on out to Canadian Tire at Preston Crossing on July 26th from 11AM - 4PM and enjoy a tasty hamburger, Veggie Burger and/or hotdog! All proceeds go directly to the cost of our increasing vet bills. 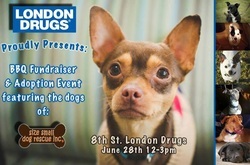 Come on by for a BBQ lunch put on by the fine people at LondonDrugs on 8th Street and meet some super cute adoptable dogs as well! — at London Drugs Saskatoon. Spread the word! 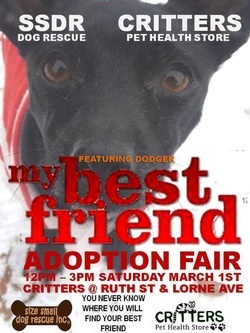 The SSDR dogs will be out looking for their Furever Families this Saturday! It's going to be a beautiful weekend! 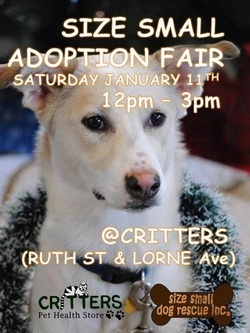 News for the week: Our first adoption fair in March will be at Critters on Ruth Street on March 1st from 12-3. That is next Saturday. Come on out and visit with the dogs. And maybe find the newest member to add to your family! 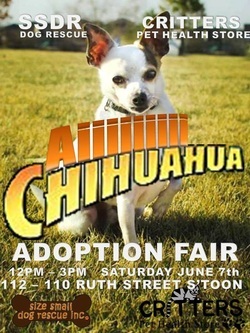 Come on by and meet our Adorable Adoptable Dogs! SOLD OUT - thanks to everyone for all of their support!!! We will also have a silent auction table filled with fantastic items and a 50/50 draw. Tickets are $20 for adults and $10 for children 10 years of age and under. All tickets must be purchased in advance (by February 4), there will be no tickets at the door. SPECIAL NOTE: The new SSDR clothing will also be available for purchase at the event! 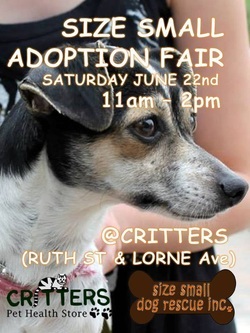 Carrara and her siblings WILL be attending! 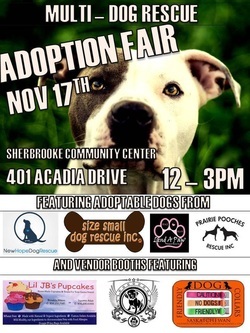 We are having a Adoption Fair Sunday November 17th from 12pm - 3pm! Rumor has it that today someone found a Minon Costume ...... Too Cute! We can't wait to see all the creative costumes! 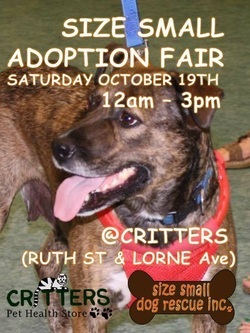 Our friends at Critters are at it again! Helping out in a HUGE way and they are matching each bag of food someone buys to donate to the rescue. 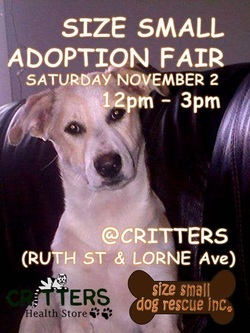 Critters is a locally owned store who have been GREAT supporters of SSDR right from the start. 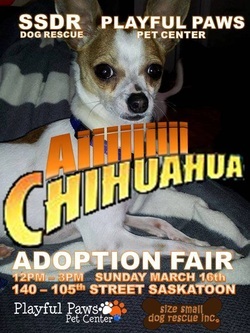 We are having another adoption fair! Our great friends at Playful Paws Pet Center have invited us to have an adoption event with their Open House on Saturday September 28th! Come on by and check out this awesome Daycare & Boarding centre and meet some of our adorable adoptable dogs. 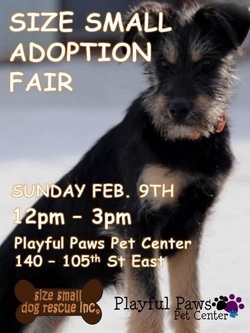 The event will held at Playful Paws Pet Center (140 - 105th Street East). Please join us for a Greek Night supper fundraising event to benefit Size Small Dog Rescue! 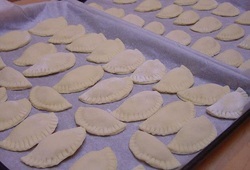 The menu includes Greek chicken, lemon roast potatoes, greek and caesar salads, vegetable, rolls and dessert bar. A vegetarian option is available upon request. There will also be a chinese auction, 50/50 draws and a door prize donated by Ens Lexus Toyota! Tickets are $20 for adults and $10 for kids 12 and under. Advance tickets only, there will be no tickets at the door. Please contact Nicole Garman (306) 373-7611 or Dawn Storm (306) 281-9005 to purchase. Cash bar starts at 6:00 pm with supper to be served starting at 6:30 pm. Come on out to Canadian Tire at Preston Crossing and enjoy a tasty hamburger and/or hotdog! All proceeds go directly to the cost of our increasing vet bills. 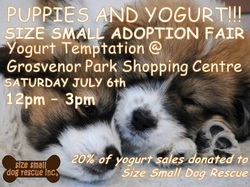 SSDR is hosting an adoption event next Saturday, July 6th from 12-3 at Yogurt Temptation At 36-2105 Grosvenor Park Center 8th St E, Saskatoon. 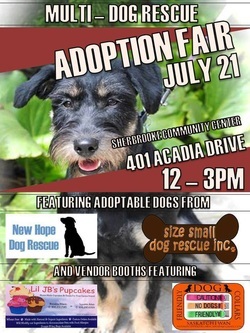 Come on out - support a great rescue, meet the amazing dogs and enjoy a tasty treat! Hope to see you all there! 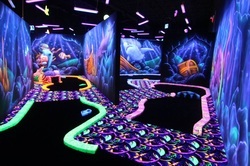 Join us on Wednesday, June 26th from 6:30 to 9 pm for an evening of fun for all ages at Mar's Mini Golf - Saskatoon's coolest 3D glow-in-the-dark mini golf course! Tickets are $15, with a portion going directly to Size Small Dog Rescue, and include one round of glow golf, your choice of pizza (cheese, pepperoni, ham and pineapple, loaded or meat lover's) or hot dog, and a drink. There will be staggered start times so you won't have to worry about getting there too early or long line ups. Tickets must be purchased in advance (cash only please), there will be no tickets available at the door. Please contact Nicole Garman (through Facebook or by phone 306-373-7611) to arrange delivery of tickets. ** All money raised from the mini-golf event will go towards vet bills for our foster dogs - and those costs have gone up significantly from the $26,000 spent last year so please join us in helping the dogs and having a fun evening as well. Please Note - the 9 orphaned puppies will NOT be there as they just received their first set of vaccines. 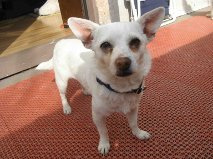 Are you looking for a furry friend for life? 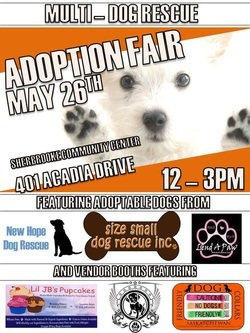 Please check out our next adoption fair with dogs from a few different rescues :) It is at Sherbrooke on Sunday, May 26th from 12-3. Hope to see you there! 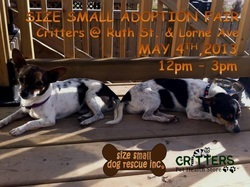 ADOPTION EVENT NOTICE : Come out and see all the cuties Saturday May 4th from 12-3 at Critters Pet Store on Ruth. 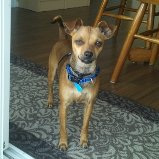 We have amazing pups available that are looking for their forever homes! Are you looking for a furry friend for life? 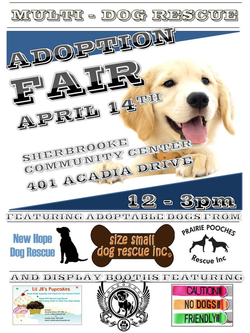 Please check out our next adoption fair with dogs from a few different rescues :) It is at Sherbrooke on Sunday, April 14th from 12-3. Hope to see you there! Come check it out!!!! 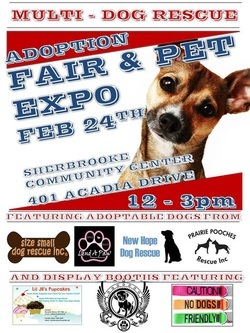 We will be at Sherbrooke Community Centre on February 24th from 12 - 3pm. This event it going to be a blast. Also 3 great Vendors too! Come visit our adoptable dogs at Rayna's Day of Play. 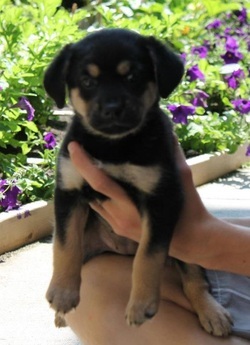 $50 from each adoption will be donated to the Chidlren's Wish Foundation in honour of Rayna. 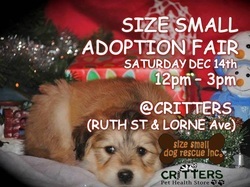 Come chat with the Size Small Dog Rescue team and meet a few of our adorable dogs available for adoption.